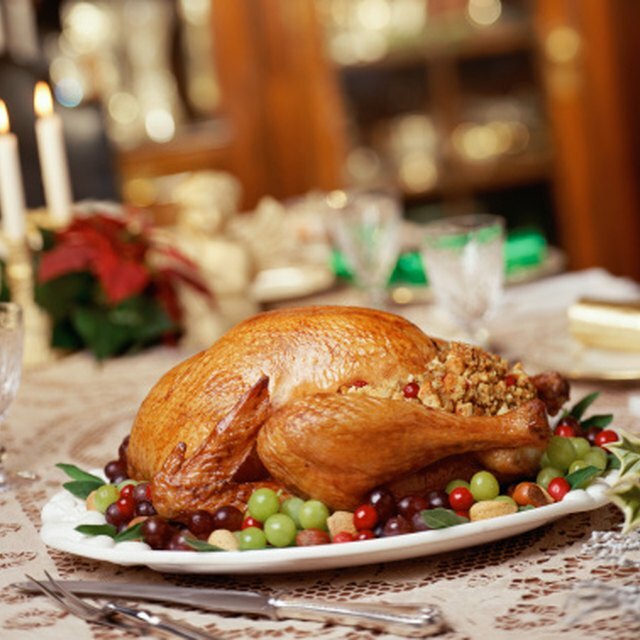 Turkey is most commonly served during the holiday season, but has gained in popularity for family dinners year-round. Turkey breast is typically sold boneless and can be cooked in many ways. Cook boneless turkey breast on the grill, in a slow cooker or in the oven. Poultry dries out very easily if it is overcooked or heated at a high temperature. The keys to a juicy, flavorful turkey breast are seasonings, preparation and proper cooking. Marinate your turkey breast in a citrus-based or acidic marinade. A simple marinade is one made with creamy dressing and your favorite herbs. Thyme and rosemary are ideal with the light flavors of turkey. For a sweet and smoky taste, make a rub using a blend of Mexican spices, such as cumin, chili powder and cayenne, mixed with a brown sugar base flavored with cinnamon, ginger and allspice, or marinate in a Southwest-seasoned creamy dressing. Roast the turkey breast for close to 30 minutes per pound. A 1.25-kg turkey breast equals 2.75 pounds, and should cook for 60 to 75 minutes at 325 degrees Fahrenheit. Use a shallow pan and cover it with aluminum foil to protect the outer edge of the breast from drying out or hardening while the meat cooks. Check the thickest part of the breast with a meat thermometer to verify that the meat has reached at least 165 degrees Fahrenheit, the minimum temperature recommended by the U.S. Department of Agriculture for cooking poultry. Always let the meat rest for 20 minutes before slicing it so that the juices can distribute throughout the breast, avoiding a runny mess, and always wash any utensils, dishes and pans that have come into contact with raw poultry. Place the breast in a roasting bag and follow the cooking directions recommended by the manufacturer. The roasting bag retains the moisture from the meat, steaming it inside the bag to produce a moist final product. The USDA recommends that you increase the base cooking time by 50 percent if you are cooking a frozen breast without thawing it first, but always use a meat thermometer, not time alone, as your guide. How Do I Stuff a Chicken Breast So the Filling Doesn't Leak Out?